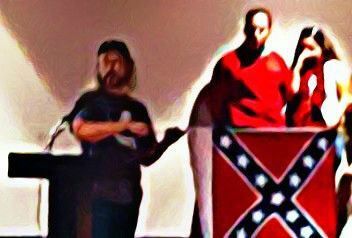 According to news reports, people living in the Springboro, Ohio School District are upset after a local tea party member unfurled a Confederate flag at a school board meeting and made racist comments, while – of all things – attending the meeting to “speak about summer Constitution classes”. Sonny Thomas, who according to a Springboro Tea Party group’s website, is its president and founder, went to the meeting because Springboro’s School Board had cancelled the classes because of allegations the curriculum had “religious undertones” and were “tea party leaning.” Both of course would be justifiable reasons for the board to act as it had – something called “separation of church and state,” especially since many in the Tea Party seem incapable of separating itself from wanting to establish a Christian theocracy, or a Christian version of Shariah law in the United States. One of the groups “sponsoring” the classes is the Institute of the Constitution, which declares in its Mission statement, “There is an Almighty, Everlasting, Omniscient God – the God of the Bible – Who is active in the affairs of men. “Our rights, including our right to life, liberty and property come from Him. Yeah, the School Board was more than a little justified in cancelling the so-called “classes” from a group which openly declares the “duty of civil government to secure, protect and defend these God given rights, to acknowledge out Creator, glorify Him and make Him known” and advocates the overthrow of the Federal government if it fails to meet the groups expectations. The group is right-wing uber-Christian at best, and a nest of traitors at worse. yes, anyone who calls for the overthrow of the government is a traitor, not a patriot. 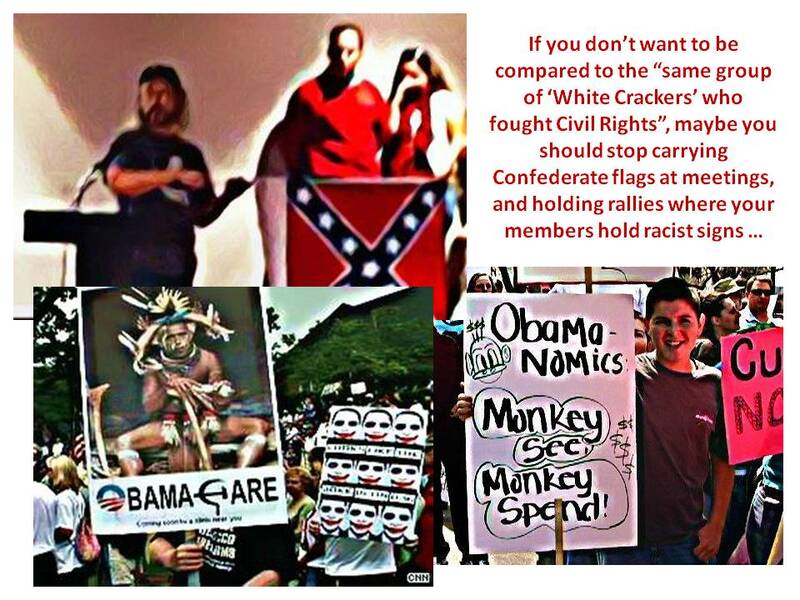 Sonny, whose feelings are well known in the community through his racist tweets, claimed he was there to defend the Constitution classes, but then, according to sources, let his mask down and began making racist comments and endorsing the League of the South, an organization advocating secession, state’s rights, and which calls the federal government an “enemy of the people”. At the end of his speech he unfurled a Confederate flag and asked the audience if they were offended. It’s always interesting when these “good ol’ boys” proclaim a love for the Constitution while advocating the overthrow of the country and the legitimacy of nullification and secession. 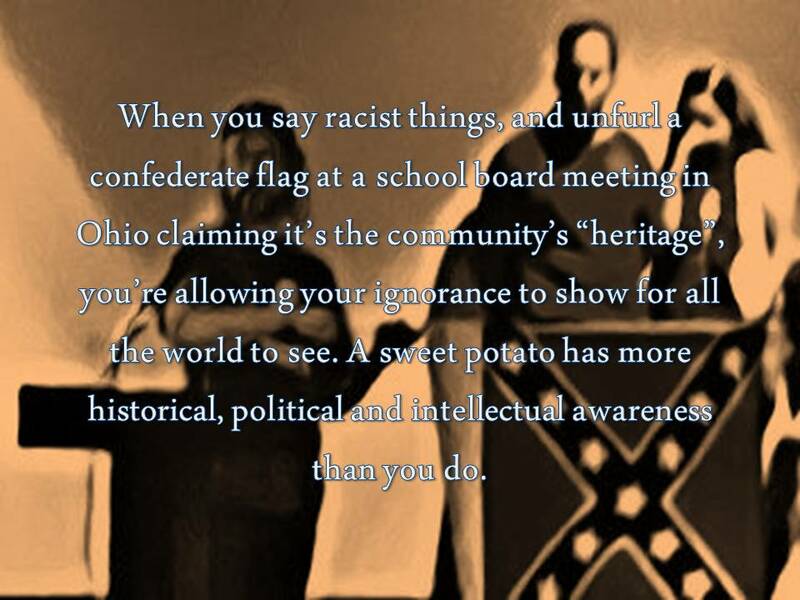 How is the Confederate battle flag the “heritage” of Ohio? Mr. Thomas needs to read some history. Ohio remained part of the Union during the Civil War raising more than 250,000 troops, and supplying millions of tons of supplies and materials to preserve the Union, as well as being the home state of Union Generals Ulysses S. Grant, William Tecumseh Sherman and Philip H. Sheridan. By-the-way, Sonny, Ohio also played a key role in the Underground Railroad – having more safe houses than any other community in the state – ferrying escaped slaves north into Canada; and incidentally, in case you haven’t noticed, Springboro isn’t exactly in the southern end of the state. 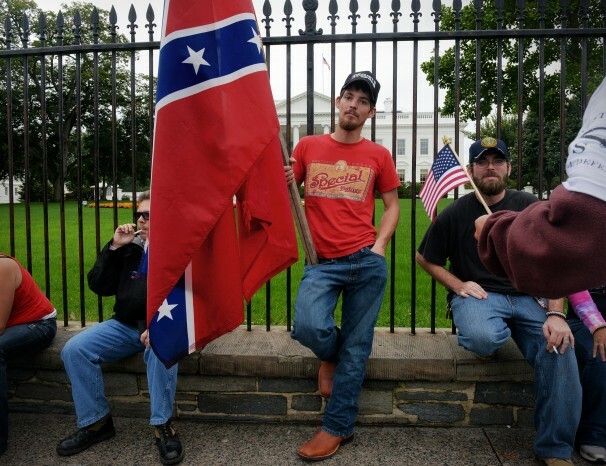 Tea Party members are always claiming the group isn’t racist, that it appeals to people of all races, colors, creeds and religions, and yet we keep seeing basically all-white audiences, racist signs, Confederate flags and calls for secession and the preservation of “states rights”. The preponderance of evidence suggests the majority of the group is racist, and it is anything but patriotic. Calling for secession, or the overthrow of the democratically elected government is not patriotic. Personally, I’m tired of the tantrums and the threats; please rise up and start your “rebellion”. The sooner you do, the sooner those of us who have sworn an oath to defend the Constitution can do so, and the sooner the rest of us can move on with real issues and problems our county is facing. In other words, “Put up, or shut up”. Tea Party says Romney Better Move to Right? According to news reports the Tea Party (whoever that really is) following an upset primary win by Tea Party (TP) backed Ted Cruz in Texas is telling the presumptive Republican Tea Party (GOTP) presidential nominee Willard Mitt Romney he better start toeing the mark. Cruz won the Texas Republican primary Tuesday night, which considering it is Texas is a virtual win in November as well. His victory appears – at least on the surface – to be the latest in a string of TP candidates to use anti-establishment frustration within the party to overcome the seemingly deep pockets of more “traditional” conservative candidates; meaning it’s possible to defeat money in the general election folks – even the seemingly bottomless pockets of the Koch Brothers. Of course, first you have to be able to elect “a really conservative House and Senate”, which is unlikely; and second, Willard has be elected President, something also increasingly at odds with the current political trends in poll after poll, but certainly something that could change as Americans are nothing if not fickle. “If the Tea Party says it wants Romney to move right, I think, that’s were Romney is going anyway,” Newton Leroy Gingrich, former House speaker (who resigned after multiple extra-marital affairs were revealed) and failed GOTP presidential candidate, told ABCNews.com. Yeah, but having that “pretty activist opening day” is a long shot at best, and your candidate just doesn’t seem to have the moxie to pull that off. Yes, Willard’s trying to have it both ways, being part of the TP and part of the more traditional side of the party; problem with playing both sides is sooner or later you have to choose because a “house divided against itself cannot stand” observed on rather famous former Republican President. The problem with the Tea Partistas is they just don’t want a candidate simply moving their way they want them completely indoctrinated and marinated in the TP way of life. Romney’s already moved so far to the right during the primaries he’s bending himself into a pretzel to show he’s not some right-wing lunatic, and it’s only adding to the political perception that he’s a flip-flopping etch-a-sketch candidate. As former Democratic Speaker of the House used to say, “All politics are local”; winning a senate seat in Texas is one thing – especially in a deeply red state, taking those fringe far-right bumper sticker talking points and winning a national election for the presidency is entirely different. The TP had one of its own on the ticket in 2008 and the result was a resounding defeat. 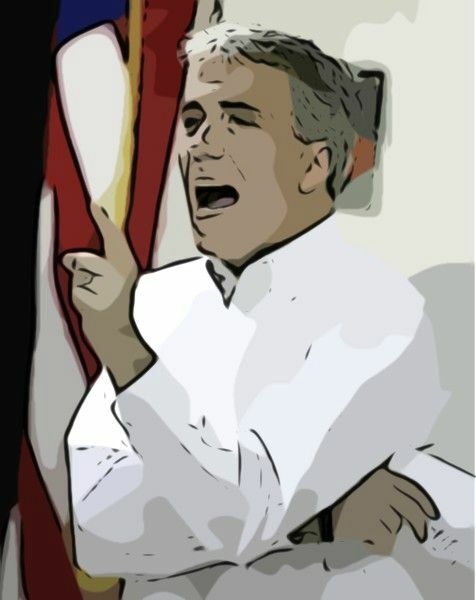 Republican Tea Party (GOTP) Congressman Joe Walsh has received the coveted distinction of being named among Congress’s thirteen “most corrupt” representatives by the group Citizens for Responsibility and Ethics in Washington (CREW). The seventh annual ranking, based on news reports, Federal Election Commission reports, court documents and financial disclosure forms, also included one senator – GOTP favorite David Vitter — and five additional House members who received “dishonorable mentions.” Altogether, the group includes seven Democrats and twelve Republicans. Walsh spokesman Justin Roth responded to the ranking by describing CREW as having “a history of being a very left partisan group that tends to trash conservative leaders in Washington,” according to NBC Chicago. “Joe Walsh has not done a single thing that’s corrupt and will continue to be a strong voice on conservative issues,” Roth continued. Spit-take, clean off key board, excuse me? “Walsh has not done a single thing that’s corrupt”? Well, gee, how about Mr Family Values lying about his income, failing to pay child support and allowing his children to do without? A wise man once said, “No other success can compensate for failure in the home.” Walsh is clearly a failure in the home, and what makes it worse is he was dishonest about it. How about some good old conservative take care of your debts talk? Walsh is accused of owing more than $100,000 in back child support to his ex-wife Laura — allegations he has dismissed as “wildly inaccurate,” even though a judge ordered Walsh to provide the court with proof that he is not a deadbeat dad. In his ex-wife’s filing, last December, she claimed that Walsh said he could not afford to make the payments for their three children while, at the same time, he loaned his own campaign $35,000 and took vacations abroad. “I’m sorry dear, I just don’t have any money to take care of family responsibilities, I’m too busy loaning my money to my election campaign,” his Brain Captain said. Alas, back child support allegations aren’t the only questionable financial practice allegations against Walsh. He’s also been accused of stiffing his former campaign field director Richard Cape of $20,000 in pay. Two other staffers allegedly quit after they accused him of not properly disclosing a 2008 home disclosure and traffic citations to the public. Walsh is just another “don’t do what I do, do what I say” Tea Party crack pot, who will likely only serve one term and then he’ll be a foot note in congressional history. If you’re party claims it stands for “family values”, “duty”, “country”, “honor”, “mom’s apple pie” etc., then you better make darned sure your candidates stand for those things, or is this just normal Republican Tea Party hypocrisy in action? Beck to Lead a Holy Crusade to Israel? Glenn Beck recently announced on his radio show that he is planning to hold a rally in Jerusalem sometime in August called “Restoring Courage.” This of course will be his Holy Land version of his “Restoring Honor” rally last August in Washington D.C. I cannot imagine anything more ludicrous than Glenn Beck presuming to hold a rally in Israel named “Restoring Courage”. Talk about being clueless. Of all the countries in the world, he’s going to go to Israel and presume to take his act there and tell the Israeli people about courage? What makes this more ludicrous is the fact Beck is a borderline anti-Semite. I’m sure he’ll just be adored in Jerusalem. Of course with Beck’s ego he’ll probably demand to enter the city on a white colt and have palm fronds thrown on the ground in front of him. I’m really surprised he hasn’t scheduled it during the Passover, and then claim he didn’t know; like last year when he held is DC rally on the anniversary of Dr. King’s, “I Have A Dream” speech and then claimed he didn’t know it was the same date. Beck recently visited Israel and Jerusalem, and he’s been doing his best Billy Graham impression, warning his listeners of impending disaster in Israel, because of a “two state solution that cuts off Jerusalem” from the world. Something no one has proposed, except in Beck’s frazzled mind. “God is involved in man’s affairs, but so is the force of darkness,” Beck preached ominously. “I believe I’ve been asked to stand in Jerusalem. Many in the history of man have had the opportunity to stand with the Jewish people…and they have failed.” He asked listeners to “stand with me, in Jerusalem” in August. 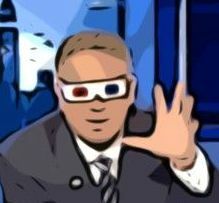 So, now Glenn Beck has elevated himself to the roll of Prophet? He believes he’s been asked to stand in Jerusalem? 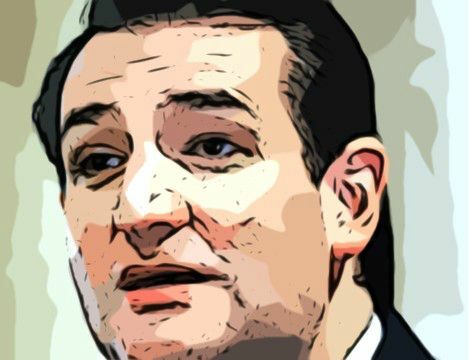 He wants is listeners – aka his congregation – to go to Israel with him and to have a Glenn Beck crusade there? He’s calling his Jerusalem crusade another “life altering event” (the same verbiage he used to hype his evangelical meeting in the DC) but now there’s a twist, it seems the powers of the Adversary are opposed to Beck and he’s warning his followers that the “very gates of hell” would fight his attempts to hold his rally. OK, it’s official. He’s certifiable. He’s now declared he’s speaking for God, and that Satan is opposing him. Maybe Glenn he’s not opposing you, maybe he’s all the voices you’re listening to. As I’ve said before, God works in mysterious ways, not stupid ways.